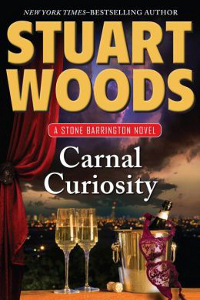 Stuart Woods is back with the 29th book in his successful Stone Barrington series. You’re going to have to wait until April 2014 to get your hands on Carnal Curiosity, this latest outing, but inside sources suggest it will be well worth it. Stone Barrington seems to have a knack for being in the wrong place at the wrong time. When Manhattan’s elite fall victim to a series of clever crimes, Stone and former partner Dino Bacchetti are drawn into the world of high-end security and fraud. Insider knowledge and access are limited to a very privileged few and the wealthy are made vulnerable by the very systems meant to keep them safe. As Stone and Dino delve deeper into their investigation, they learn that the mastermind behind the incidents may have some intimate ties to Stone . . . and that the biggest heist is still to come. Just like his characters, Stuart Woods is something of an adventurer. And like fellow best-selling crime writer James Patterson, he began his career in the advertising business – perhaps that’s where they each learned to craft a compelling narrative. During the seventies, while living in Ireland, Woods became a successful trans-Atlantic yachtsman, competing in a number of races. Now back in the US, he has a pilot’s licence and is well-known for flying between book tour venues in his private Cessna jet. He wrote his first novel, Chiefs, after finding a damaged and bloodstained police chief’s badge in his grandmother’s home. The novel later became a TV miniseries staring Danny Glover and Charlton Heston and won the Edgar Allen Poe prize from the Mystery Writers of America. He’s occupied a place in the New York Times bestseller lists ever since.